The common explanation of these peculiar deformations of the Buntsandstein quartzite cobbles and boulders as to originate from overburden pressure dissolution and tectonics, speechified since decades to geologists and in all geological excursions, has no scientific basis. Even the “normal” non-geologist is convinced – we’ve made many tests – that the deformations can be explained only by a very rapid and powerful event. Nevertheless, many geologists insist on their absurd ideas, and even very curious arguments have been articulated. A German professor of geology/paleontology confronted with the impact explanation and the typical impact features simply answered: “I don’t believe it”. We may tut-tut at this geologic thinking but it reflects the basic lack of physical understanding of geological processes combined with the traditional aversion for catastrophism in geology and the insistence on familiar, especially regional, geology. 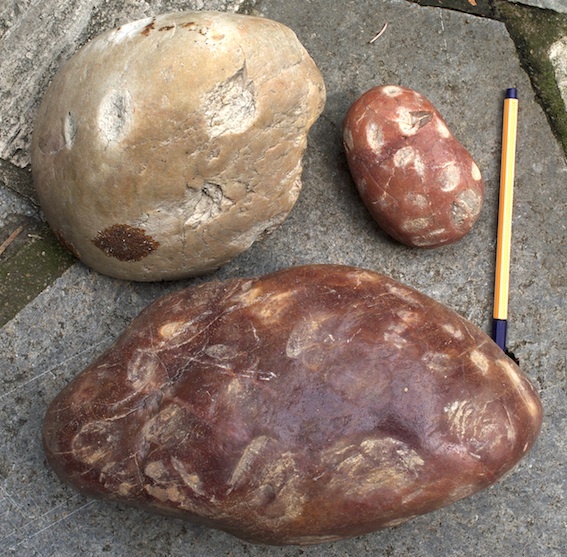 Pock-marked, cratered and highly polished quartzite cobbles from the Spanish basal Buntsandstein conglomerates. From pressure dissolution and tectonic overburden? Three papers have been published rejecting the impact origin for the deformations, two of them as discussion papers of the publication of Ernstson et al. (2001) in the reputable GEOLOGY journal. Cratered cobbles in Triassic Buntsandstein conglomerates in northeastern Spain: An indicator of shock deformation in the vicinity of large impacts: COMMENT. – Geology, January, 2002, v. 30, p. 91.
the categorical denial is not at all surprising. They have basically and again and again rejected all impact ideas and investigations for the region where they had left their first geological footsteps and later wrote thick articles and theses about the regional geology in the Azuara and Rubielos de la Cérida impact structures. Cratered cobbles in Triassic Buntsandstein conglomerates in northeastern Spain: An indicator of shock deformation in the vicinity of large impacts: COMMENT. – Geology, November, 2002, v. 30, p. 1051. Their comment paper on the shocked cobbles in Spain is a little bit surprising at first, but can simply be explained. The Dutch geologists have been working exactly in the area of the shock-deformed Buntsandstein conglomerates, and they have obviously not realized the true nature of these peculiar features and instead cherished the common pressure dissolution and tectonics model. Always the same old story. We should mention that the coauthor Jan Smit is not exactly an unknown person among impact researchers, particularly by his passionate debate with Gerta Keller from Princeton on the K/T Chicxulub impact event . And now this! The reputable impact researcher, geologists and sedimentologist Jan Smit is unable to see and understand a clear impact setting in the field. has thoroughly been commented by F.Claudin and K. Ernstson which can be clicked HERE. Here we may summarize: This article presented at the LPSC is really bad science because it ignores basic scientific standards when addressing the Spanish shocked Buntsandstein quartzite conglomerates. Please read!